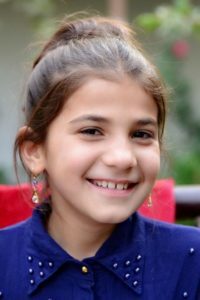 It was two years ago when I met 7 year old Moqadas at our Miraculous House-she was with her sister who was inquiring about joining our group-when I motioned Moqadas to wait in the other room she pointed her index finger back at me,then to her self and then to a guitar sitting near by-basically she was informing me that I was going to teach her how to play the guitar and that was that. Now 9 she is the youngest member of our group 1 girls and certainly the most precocious. She enjoys singing Purple Rain by Prince and playing 7 Nation Army by The White Stripes.